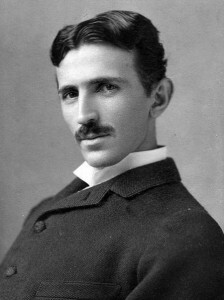 Tesla was born on July 10,1856, to Serbian parents living in the Croatian village of Smiljan. His father was a Greek Orthodox priest, and his parents expected him to enter the clergy. However, his talents were in mathematics and science, and he decided to train for an engineering career at the Technical University at Graz, Austria. At Graz a professor demonstrated the Gramme dynamo, a direct ­current motor. Tesla remarked that the dangerous sparks emitted by the dynamo could be avoided by eliminating the commutator, an attachment that reverses the current in the coil. His suggestion was met with skepticism, but the experience kindled a desire to overcome the problems of direct ­current motors. After brief electrical­ engineering tenures in Budapest and Paris, in 1884 Tesla sailed for New York, where he took a position at the laboratory of THOMAS EDISON. Tesla failed to convince Edison of the need to devise a new type of motor based on alternating current (a current that continuously changes direction), which Tesla saw as the wave of the future, but which Edison claimed was dangerous. After a short time, Tesla resigned. In 1887 Tesla founded the Tesla Electric Company and dedicated himself to designing an alternating­ current motor. In his first successful model, a rotating magnetic field was created when an alternating current was supplied to the wire ­taped blocks surrounding the rotor. He demonstrated that alternating current allows strong electrical currents to travel long distances, whereas direct current is limited to local use. In 1891 Tesla devised a transformer, now called the Tesla coil, that allowed the transmission of high frequency, high­ voltage alternating current. Inventor and manufacturer George Westinghouse bought Tesla’s patent for the alternating­ current motor and used the system to light the 1892­93 Columbian Exposition in Chicago, the first world’s fair to have electricity. Tesla subsequently won a contract to build the first hydroelectric power plant, at Niagara Falls, New York. It was completed in 1895. Turning to the investigation of radio waves, Tesla accomplished wireless communication across a 25­mile distance in 1897. From 1898 to 1900 he lived in Colorado, where the dry air was a good transmitter for high­ frequency waves, the focus of his research during his remaining years. In the early 1900s Tesla turned his attention to transmitting high­ frequency waves across long distances without wires. His most ambitious endeavor at this time, a project for building a wireless world broadcasting tower, was defeated by financial difficulties. His claims began to verge on the outlandish, tarnishing his public image. He was ridiculed for announcing that he had received radio signals from intelligent life on other planets and that he had invented a death ray with an enormous destructive capacity. He became increasingly reclusive, possibly the victim of a medical disorder causing mental degeneration, and retired to a hotel room in New York City. He died there on January 7,1943. Tesla’s accomplishments helped shape the modern face of electrical technology. Because Tesla’s work on high ­frequency waves involved general concepts associated with electricity and magnetism, it provided the basis for research in other fields. Physicist Robert Golka used Tesla’s notes (housed at Belgrade after World War II) in his studies of plasma—gas composed of equal numbers of negatively and positively charged atomic particles. Plasma, formed in stars, lightning, and thermonuclear reactors, is a good conductor of electricity; plasma plays a crucial role in the development of fusion­ powered energy (a theoretical future method of providing power via fusion of atomic nuclei). Soviet Pyotr Kapitsa, a 1978 physics Nobelist, used Tesla’s experiments as models for his pioneering research on the electrical conducting properties of materials placed in high ­strength magnetic fields. Tesla’s alternating­ current system has become the dominant power transmission method throughout the world. Power grids that supply cities with electricity use alternating current, which enables the use of transformers to control the level of power supplied to industries, businesses, and homes. The Tesla coil is an integral component of modern radio and television sets. The design principles of the hydroelectric power plant that Tesla constructed at Niagara Falls became the model for hydroelectric plants throughout the United States.